Additional modification to the original glass is the retooled front end ground clearance. 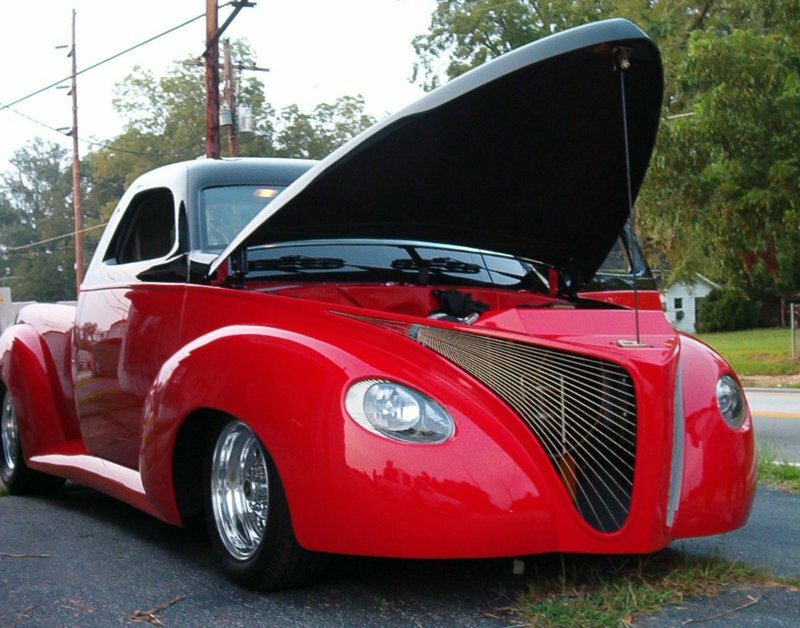 In order to achieve the ideal stance, it was necessary to alter the nose ground clearance by removing 4 inches of the span from the grille box to the ground. This allowed for permanent lowering of the front end without the assistance of bags. The results were dramatic! 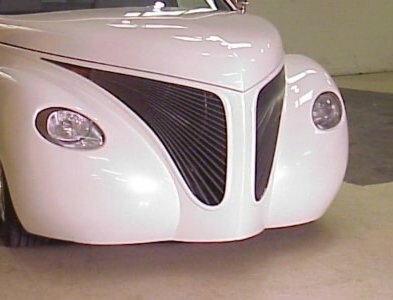 This modification allowed the use of 2.5 drop spindles, 15 inch Weld DFS Draglites and low profile Cooper Cobras to achieve the complete one of a kind custom look.custom look. 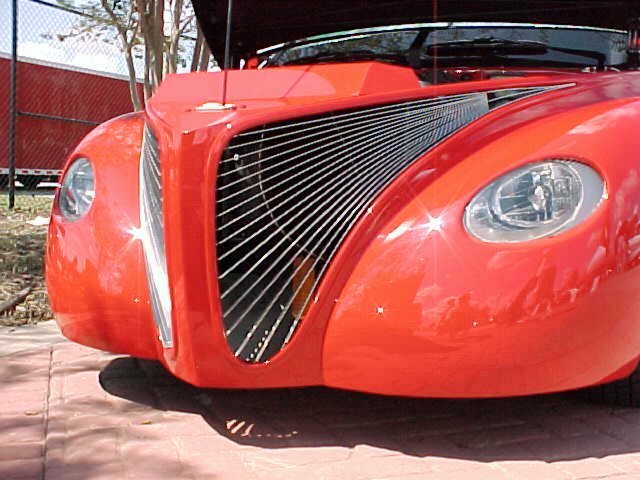 Compare the span difference from the lower grille bead to the edge. The Blue 39 shows the is original body configuration. The fine blue stude achieves it's stance by use of an Air Ride system. This build up also has the original tilt hood setup therefore it's not possible to open the tilt hood when the truck is in the lowest position. The upshot here is the ability to use a really big wheel set up to get the look. This truck sports 18's & 20's on the freno and the rear respecively. 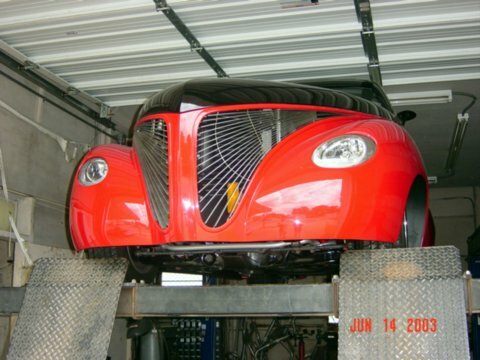 If the 39 suspension is not bagged, it has to ride taller on the frame to accomodate adequate clearance, thus giving the vehicle an overall taller look as shown below. 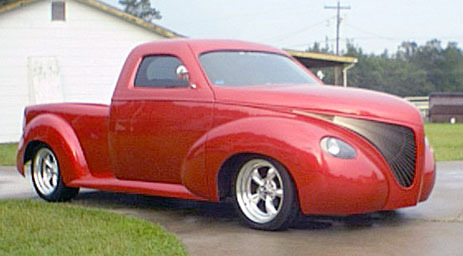 This is a standard 1939 Studebaker conversion build up based on a stock original Chevy S-10 platform using 15 inch wheels. 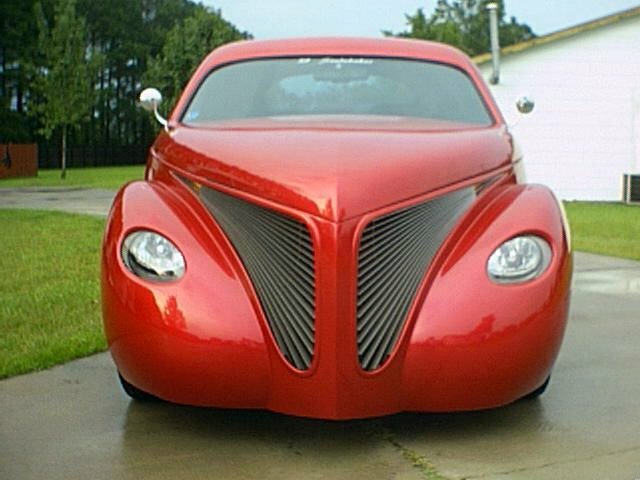 It is owned by Fred Turner in Florence SC and is used as a daily driver. Click HERE to view Fred's photo album. These nose views show the full impact of the cut. 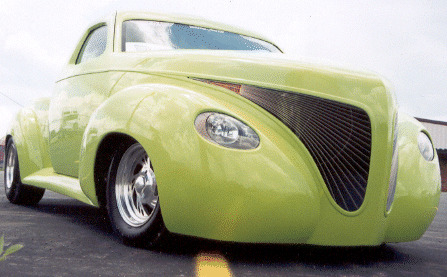 Without a bagged suspension, the nose would be on the ground. The cut allows for the permanent low slung stance while retaining much of the original ride.